"You'll appreciate this nicely spiced combination on days when you're pressed for time." Heat olive oil in a large, deep skillet over medium heat; cook and stir onion and green bell pepper in the hot oil until tender, 5 to 8 minutes. Stir garlic into vegetables and cook until fragrant and softened, about 2 minutes. Stir kielbasa sausage, tomatoes with juice, water, paprika, oregano, thyme, and hot sauce into onion mixture, bring to a boil, and stir in orzo. Reduce heat to low, cover, and simmer until orzo are tender, about 10 minutes. See how to make quick-and-easy 1-2-3 Jambalaya. You may also want to brown the sausage before adding it to all the other ingredients. It is still excellent without browning first, though. This recipe lived up to the name. I put shrimp into the recipe b/c it's not jambalaya (to me) without shrimp. I skipped the hot sauce, opting for a dash of cayenne. 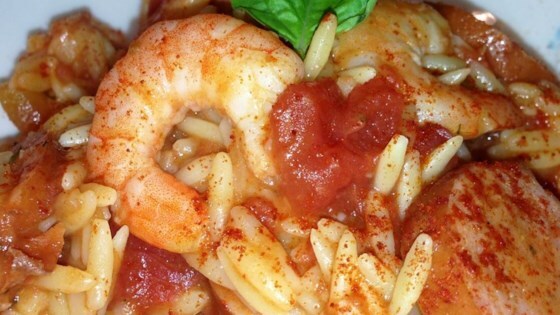 This recipe shows shrimp on the picture, but did not have shrimp in it. This was a really tasty, quick dish. I did use rice since that it what I had. I will make this again. Total quick no Brainer!! A great quick, tasty meal, easy to make. I too, used cayenne, and the flavor was fabulous! Next time shrimp and maybe some red beans. Very filling as well! It was a great base recipe, but not any heat, so I used spicy sausage, and Zatarain's Jambalaya rice and added some heat. Used Sausage instead of Kielbasa and added some Creole Seasoning I had from New Orleans. This was fantastic! This is an amazing tasty dish that my family loved! We will definitely be making this again!